If I had a nickel for every time someone expressed pity for my child because she’s never been to McDonald’s I’d be a billionaire. 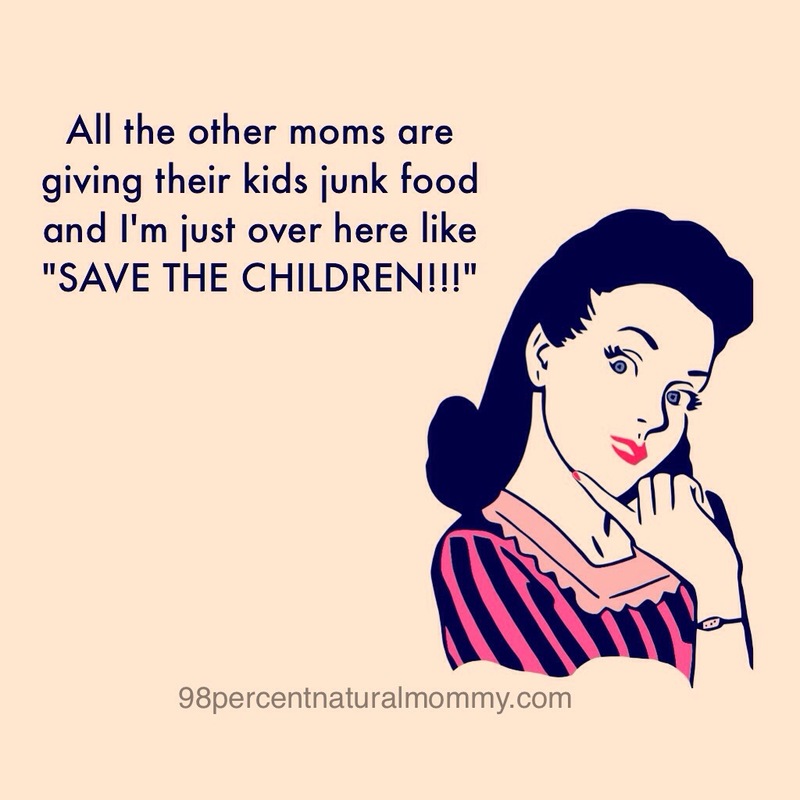 While I let my child eat treats at parties and school events to avoid having her feel left out, I do not keep them at home nor do I take her through drive-thrus. I buy and make healthy treats at home and we either order takeout or go to a restaurant as a family once a week, but fast food restaurants are off limits, and the other 6 days of the week we eat a healthy home-cooked meal. She does not feel deprived because our way of eating is normal to her. She is only 5 so she is not even aware yet of the difference between her diet and most kids’ diets. When she is old enough to notice and asks to try some of those other foods she will also be old enough to notice a difference in the way her body feels when she eats them. I am confident that that difference, coupled with the education I will give her about nutrition will make her want to continue eating healthy. And I have no doubt that 20 years from now, when the knowledge of the harmful effects of processed junk food on kids and the impact it has on their lifelong health is more mainstream, she will thank me. She will not have to struggle in her 20’s or 30’s or any age to figure out why she feels so crappy and “unwell” all the time. 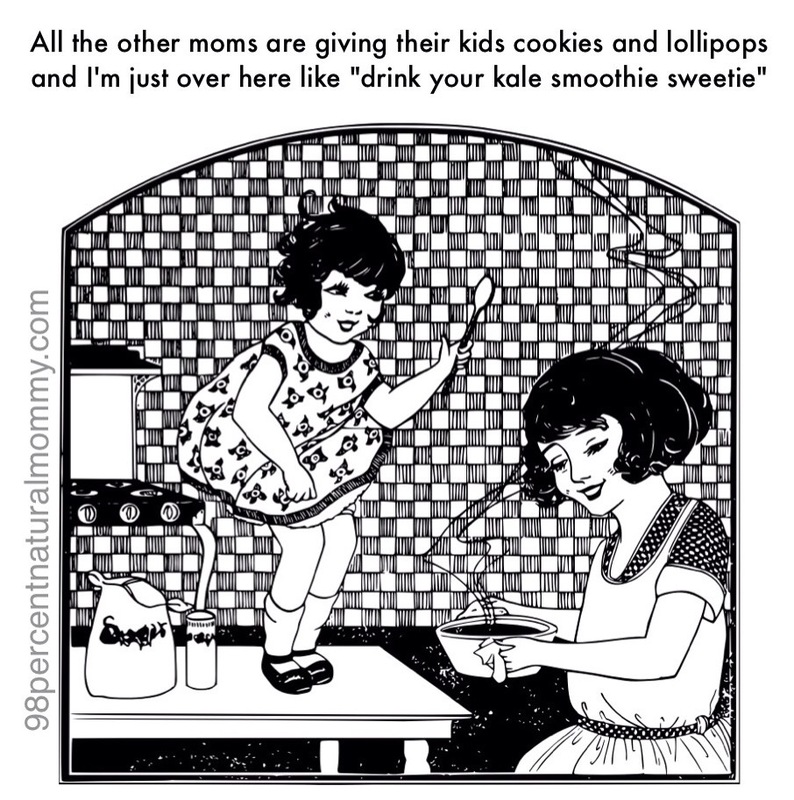 If you follow similar food rules in your family, don’t feel bad about not giving your kids junk food. Feel good about giving them lifelong good health. Because what they eat now will affect their disease risk in adulthood. Everything you feed your kids is either nourishing them or harming them, so choose real food, not processed artificial junk. The long-term benefits of eating healthy far outweigh any short-term happiness that comes with eating chicken nuggets and doughnuts. Eat Everything In Moderation: Truth, or Excuse? One of the most frustrating arguments that I hear from friends and family whom I try to persuade to eat healthier is that “everything in moderation is perfectly fine”. But is it? The first problem with this reasoning is that everyone’s definition of moderation is different. Eating a doughnut on Monday, a drive-through burger and fries on Tuesday, greasy pizza on Wednesday, a full size chocolate bar on Thursday, and fried chicken on Friday is NOT moderation. Eating a pastry with sugary, cream-topped coffee at breakfast plus a bag of chips in the afternoon and a few unhealthy cookies after dinner all in one day is DEFINITELY NOT moderation (I actually know a few people who argue that it is, you know who you are 😉). Eating healthy meals every day drowned in unhealthy sauces (ketchup is NOT healthy!) is also not moderation. Yet so many people don’t realize that what they think is moderation actually isn’t when they tally up all of the different foods that they claim to eat only occasionally. One common mistake that I see people make is to look at each type of junk food they eat individually instead of looking at all the junk food they eat in a day or week collectively. Sure, one doughnut a week is moderation, as is one bag of chips or one chocolate bar or one pizza etc. ; but when you add all of these things up its simply too much. The second problem is that a lot of what you hear and read is promoted by companies who stand to lose a lot of money if everybody were to eat healthy. Just like the tobacco industry had doctors and researchers on its payroll for decades to convince people that smoking didn’t cause lung cancer, the junk food industry has people out there promoting the idea that a little junk food isn’t all that bad. And just like smokers who couldn’t fathom the thought of quitting supported and perpetuated the tobacco industry’s denials of a link to lung cancer, junk food addicts also support the junk food industry’s motto “everything in moderation is safe”. If this were true, smoking crack in moderation would be safe too. 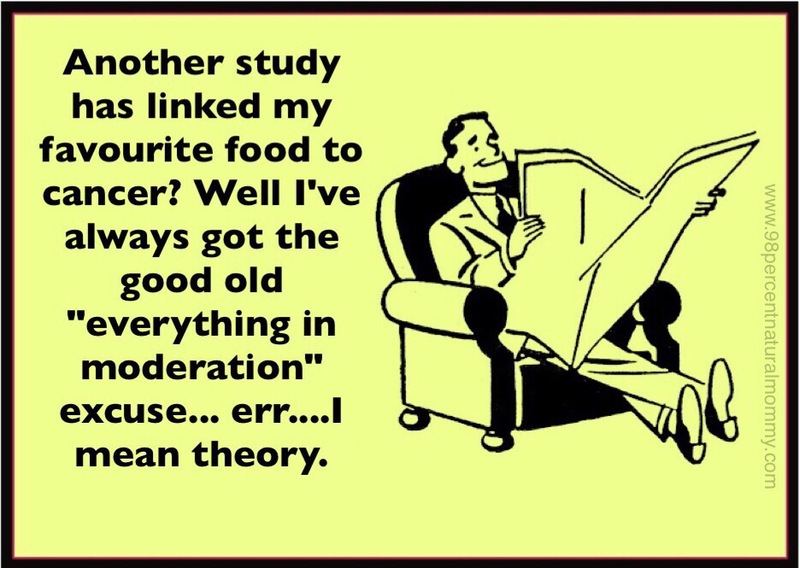 Every time a new study comes out confirming the ill-effects of a certain unhealthy food or additive, junk food addicts are quick to argue “well it’s still ok in moderation” 😒. Just like addicts of any other substance, they will ignore reason and logic and look for any excuse to continue eating the crap that they think they can’t live without. And taking the moderation angle is the perfect excuse. The third problem is that because we are exposed to an increasing amount of harmful stuff that we cannot control (pollution, radiation, etc), we must do everything in our power to avoid exposure to the toxins that are in our control. And that includes food. Yes, our bodies can handle a small level of toxic substances without any ill-effects; but when you add the cumulative effect of pollution, stress, radiation, and decreased nutrient content of food, there really isn’t any room left for “moderate” consumption of processed junk food. 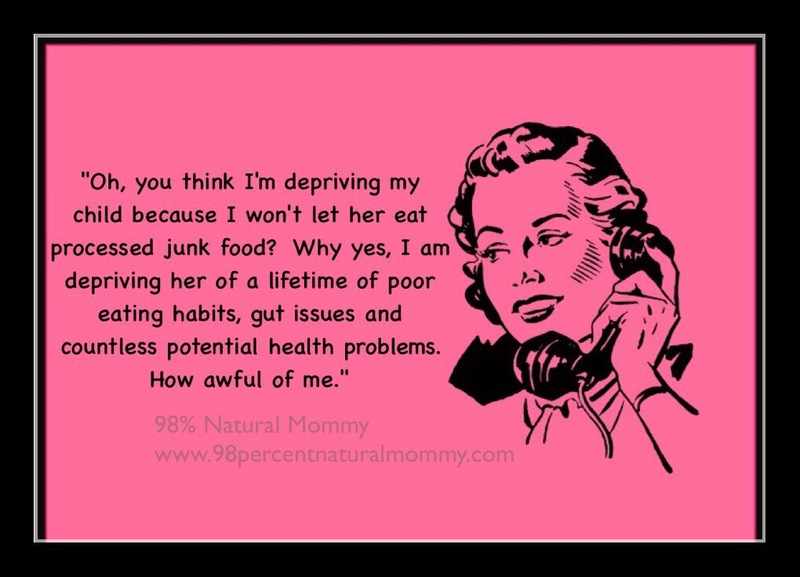 Eating mostly healthy food is not a license to eat whatever extra junk you want. I dont believe in quitting all processed food cold turkey, as that is likely to be short lived. The transition to a clean diet and lifestyle should be gradual and taken one step at a time. The best way to start your road to healthy eating is to slowly eliminate unhealthy foods that you know you can live without first, then work your way up to foods that are harder to part with. Pick a few select “junk foods” that you absolutely love and use those as your occasional (not daily) treats. For everything else, find a healthy alternative. This may seem difficult but it’s not; a simple Google search will show you that for any type of food you can think of, there is someone out there who has come up with a healthy version of it. If you love French fries, learn to make your own healthy baked version, or ask for your fries to be baked at restaurants (more and more restaurants are accommodating this request). If you love sweets, try making a big batch of naturally sweetened baked goods at the beginning of the week that you can eat when you get a craving. If you can’t survive without coffee every day then cut the sugar and cream and find healthier ways of flavouring it. If you fall off the healthy eating wagon a few (or several🙄) times, don’t beat yourself up about it and don’t give up. Just get back into it the next day. The further you go on your clean eating journey, the less those relapses will happen because you will simply lose the desire to eat or drink things that you once thought you could never give up. If you are pregnant or have kids, it is even more important for you to understand that everything is not safe in moderation. Babies and kids are developing so fast that exposure to toxins can have a negative impact on not only their growth and brain development, but also on their future health (more on that in a future post). The field of epigenetics is discovering exactly how early exposures to the right or wrong chemicals can have lifelong consequences. So stop including that mini chocolate bar in your child’s lunchbox every day as a treat for eating their vegetables. You’re basically just negating the positive effect of the healthy foods that they eat.